Years ago, I was struggling to figure out just how to get my severely dyslexic son to get beyond the CVC words like cat and sun. He had done really well to that point, then stalled out and we made little progress over the next few years. I eventually found a few things that seemed to click for him. The materials from ABeCeDarian Company were a part of that. I was fascinated to learn that they had come out with an online version of their materials. The Crew has had the opportunity to review their ABeCeDarian Interactive A Workbook along with the digital version of the Teacher Manual - A. What I loved the most about ABeCeDarian was that it was fully scripted, which frees me up from thinking too much about how to say something. That may not be a big deal when you are teaching a child who has an easy time of learning to read, but it definitely is a huge help when working with a child who finds learning to read especially challenging. Especially when you haven't ever really taught someone to read, so you aren't entirely sure what you are doing. I know some people feel really constrained by scripts, so if you hate scripts and your child is one of those who finds reading relatively easy, just skip this program. If you hate scripts, but your child struggles, well... I'd suggest taking a closer look. And this is where I confess that a decade ago, I was in the "I hate scripts" category. What changed? A couple of things. First, with my older three, I discovered that using a script for the teaching really freed my brain up to be watching my child for understanding, or for signs that we had done enough for the day. I didn't have to think so much about how to teach. With my younger two, teaching from a script was a really nice thing because it kept me on track in my crazy-busy household. I could use the script verbatim on days where I needed it, or I could say it my own way at other times. It was a nice fall-back. I did see some great results with ABeCeDarian, so even though I no longer have kids in the age range for Level A, I was really interested in seeing the interactive workbook. First thing to note: you still absolutely need to sit with your child and to have the Teacher Manual available. This interactive workbook is exactly that. A workbook. The teaching is in the Manual, and you need to do it. 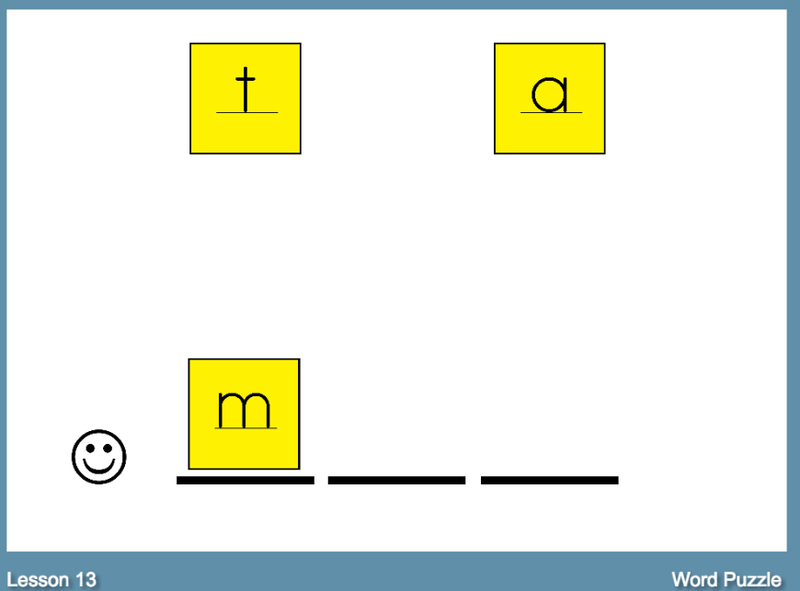 For instance, on this workbook page, the letters t, m and a are at the top of the page initially, and the student is to drag them down to form a word. At this point, you have been doing similar word puzzles for a dozen lessons already. 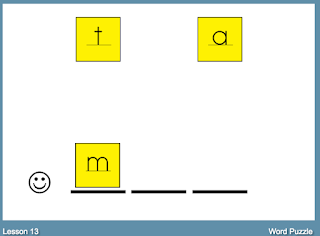 The TM tells you to inform the student that this puzzle has us making the word mat. They give you a sentence ("You can do gymnastics on a mat.") and instruct you to have the child say the word. You then ask the child to tell you "the first sound you hear in mmmmmaaat." Once they tell you that /m/ is the first sound, you have them drag the m tile down to the line on the workbook page. That would be where I am in this page when I took the screenshot. You continue through the next two sounds as well, do some other things with the word mat, and then you move on to the next workbook page. If you set your child in front of the computer and tell them to work on their ABeCeDarian, they are not going to know what to do. You do need to be there with them. Now, some pages are pretty easy to figure out, especially once you have used similar pages before. Like this one. 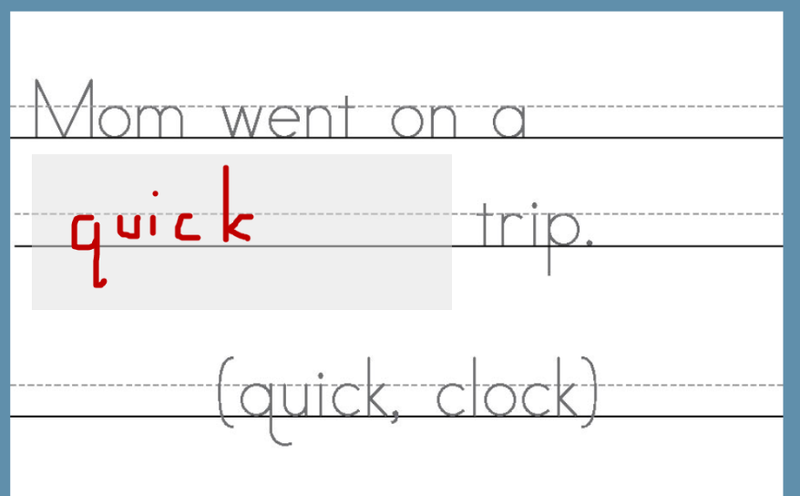 The red is where I used my touchpad to write the correct word into the blank. And this brings up one of the things I really like about this interactive workbook. 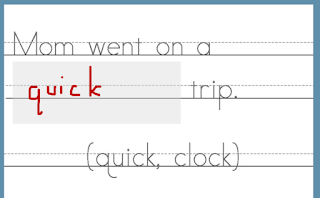 You could have the student write the correct word into a notebook while sitting at the computer, or you could have them "write" the word with their finger on the computer screen. Since you are right there, you know if they did it correctly. The computer does not grade or score anything that is done, so you just click through to the next worksheet once the child has done the work to YOUR satisfaction. I do like the interactive workbook, but you definitely need to know what you are getting into here. This isn't something you can have your kindergartner do on his own while you are teaching chemistry to your high schooler. If you have a student who will learn to read with only a little guidance, this may not be the program for them. This is a great way to do guided one-on-one instruction though, and I know it is effective. 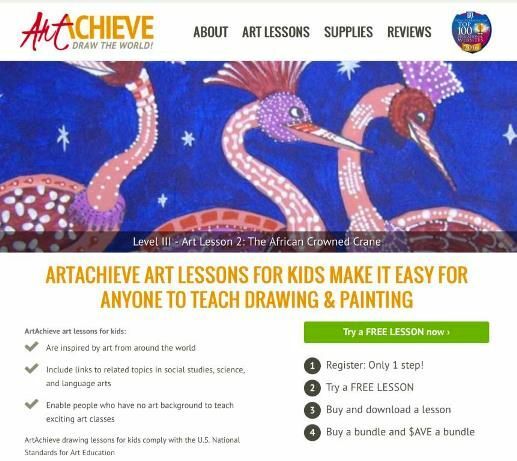 I am thrilled to tell you about ArtAchieve today. 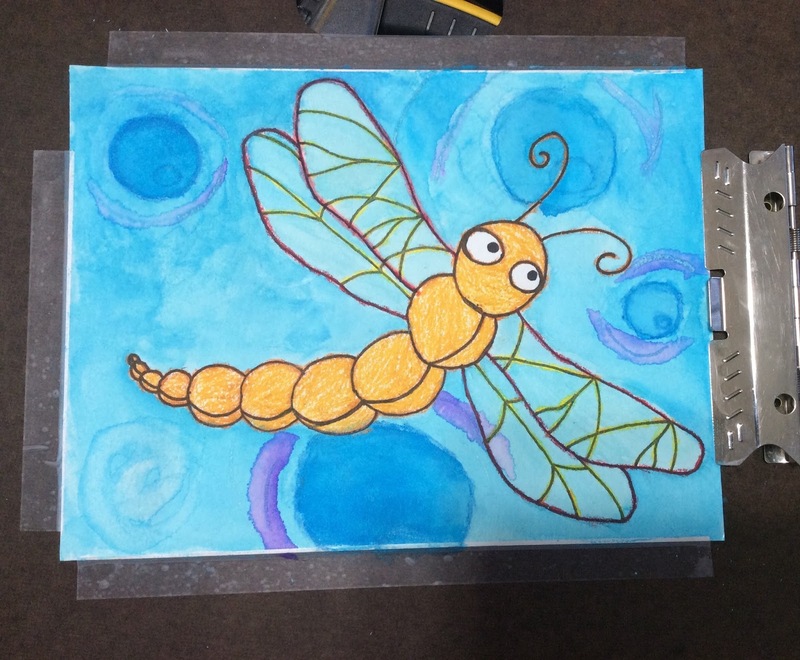 We've been using these art lessons for kids for a few weeks, and I truly love this program. As a Crew Leader, I received three bundles of art lessons. I received the Entire Level I, Entire Level II, and Entire Level III. 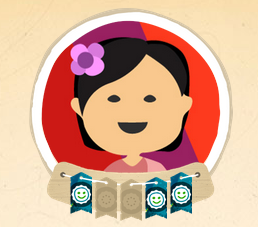 So far, we have completed five of the Level I lessons, and two Level II lessons. I don't even know where to begin in telling you what I like about these courses, so let me give you a short list, and then I can expand on some of them. Video lessons (or PowerPoint), so I don't have to do the teaching. Most of the supplies are inexpensive. Copy paper, sharpies, and colored markers are enough to do a big percentage of the projects, especially for Levels I and II. John (the instructor) is wonderful at encouraging the students to make decisions, to work with their mistakes, and to not be comparing their work to others. 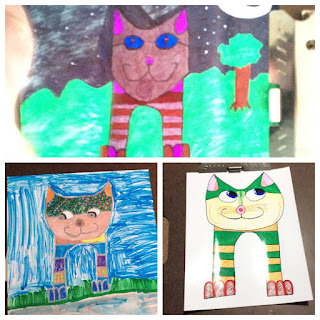 The folk art aspect brings in some fabulous opportunities for learning about other countries, cultures, and many other cross-curricular activities. These three cats? This was the very first project, and I ended up with my 10, 15 and 17 year olds doing it. The only supplies needed were paper (we did use glossy paper), a black sharpie, and colored markers. You can see that they each did their own thing with it, and all of them are interesting to view. One child wanted to really go for a background, another liked it without any background at all. The toes on the cat are interesting. There was a sample given, but in the video, John makes his toes go a different way. It's one of many places where you get the subtle message that "messing up" is okay. This lesson is available for free if you register for an account. Our most recent lesson was inspired by this little nightlight. Made from recycled glass, this is something I'd love to have in my home. This was found in Ecuador, and the cross-curricular activities are really interesting. One is to read a book about Jim Elliot and other missionaries, when they tried to contact the Auca tribe. We were already listening to a biography of Elizabeth Elliot, so we chose this particular project because of how it tied into our studies. 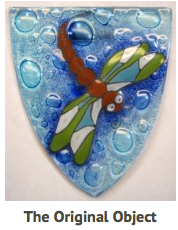 There are also activities including a link to a video about Ecuador, music from Ecuador, a lesson on geographical aspect, and a page showing dragonflies and damselflies that are native to Ecuador. In the art lesson, you start off with some rules, such as the idea that you cannot judge whether you like your piece or not until you are finished, and that professional artists don't like everything they do either. There is also a warmup for each lesson, such as the completed one pictured here -- the first and third columns were printed, the students were to copy the basic lines into the empty boxes below next to them. 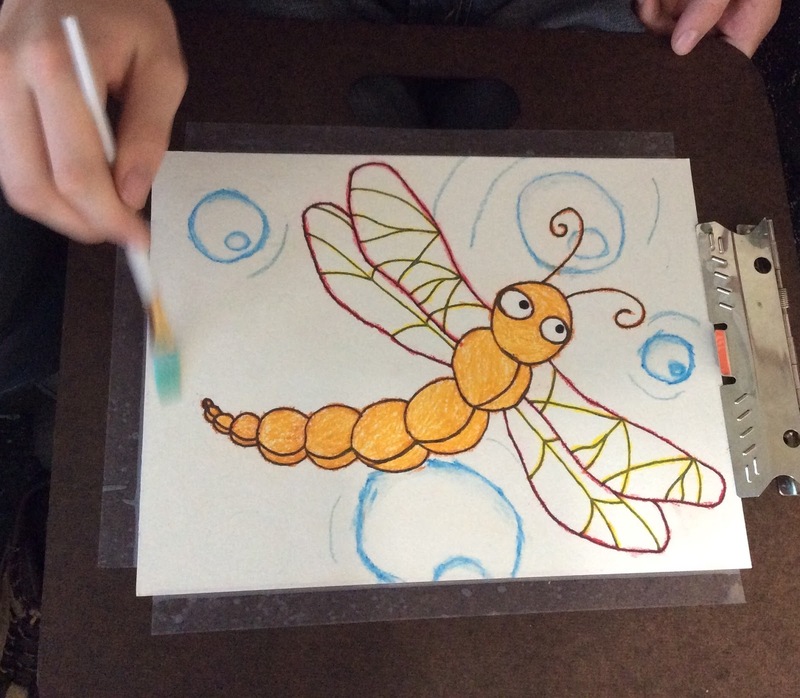 Each warmup is unique to the piece being worked on, so the students get some practice with the basic shapes and lines of this specific work. Then you work through drawing the dragonfly onto watercolor paper (this is the first project that called for something other than copy or glossy paper). "In this program, they highly encourage you to not just redo your work, but to use what marks you made and do something with it. Instead of it being a mistake and me throwing away the art piece, he encourages me to work with the lines I have and still end up with a completed piece of art." Thomas messed up one of his body circles, so it was too skinny, and he really hated it. Eventually, he realized that he could make that circle more circular, and then put a stripe down the other body segments. 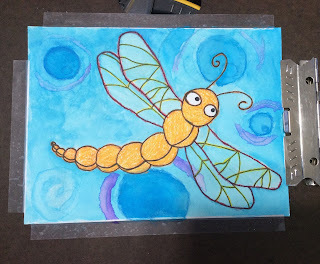 Once the sharpie drawing is done, this project involved using oil pastels to color in the dragonfly, and some background, if they wished to do that. We watched the rest of the video at this point, through the watercolor painting, so that we all knew where we were going with the entire project. I didn't get a photo of him with the oil pastels, but I was able to snap this, right as he was about to start on the next step, which is the watercolors. The video explained that if he wanted things to be white, he would need to do a white oil pastel in that space, as the oil will resist the watercolor. This was his final result. There was an optional step to add glitter glaze, and Thomas hasn't yet decided if he wants to do that or not. I think it looks really great, and he ended up liking the end result. 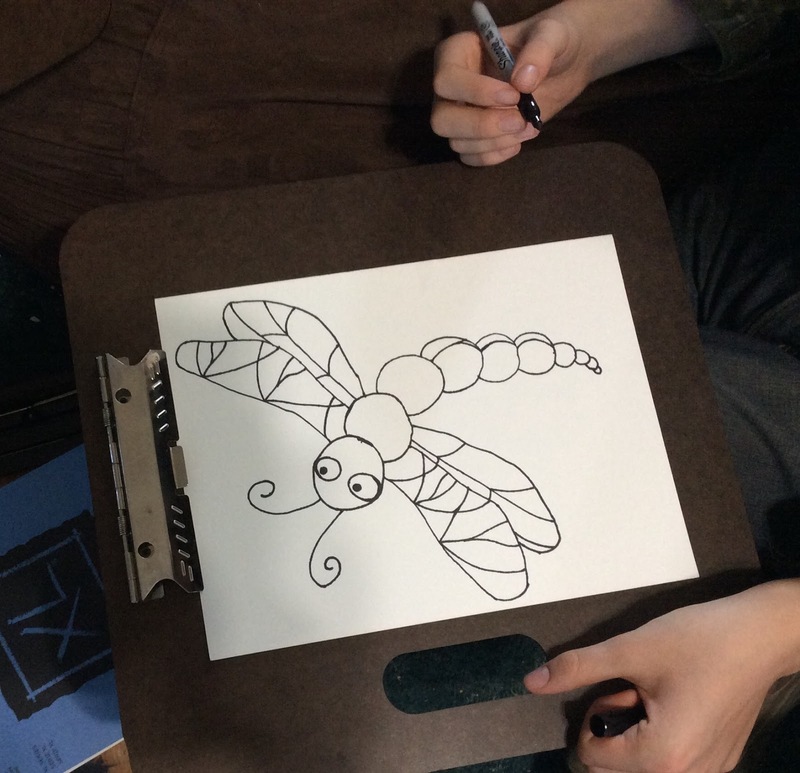 Then we were able to dig into some of the other suggested activities, like learning more about dragonflies and listening to a poem about dragonflies. We've done a whole lot of different projects, including working on some with a group of friends. Yes, that is a total of ten kids, ages 3 to 15, all drawing fish. We plan to continue through all of the lessons for Levels I-III, and then we are planning to purchase Level IV (and Level V eventually as well). 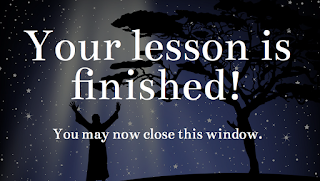 When you purchase either an individual lesson, or a bundle of lessons, you have access to that lesson for a year. Go check out what other Crew Members thought! As for my household, we love this program and are so grateful we had the chance to use it! My two elementary-aged children absolutely fell in love with the Veritas Press Self-Paced History program a couple of years ago. 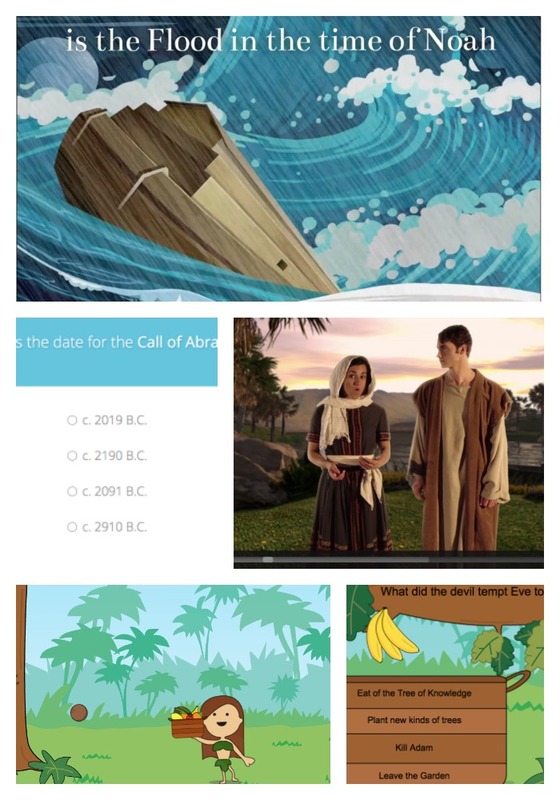 We had the chance to review the first year (Old Testament and Ancient Egypt), and have since gone on to complete New Testament, Ancient Greece and Ancient Rome. We are now working through Middle Ages, Renaissance and Reformation. They love the program. So when Veritas Press decided to have the Schoolhouse Review Crew take a look at their Self-Paced Bible and their one-year family subscription to VeritasBible.com, you have to believe that my children were excited. There are plans to add a third Old Testament level, plus a second New Testament level, but you can see the current choices at right. What is really wonderful about this is that you can have children working in different courses, all for one subscription price. 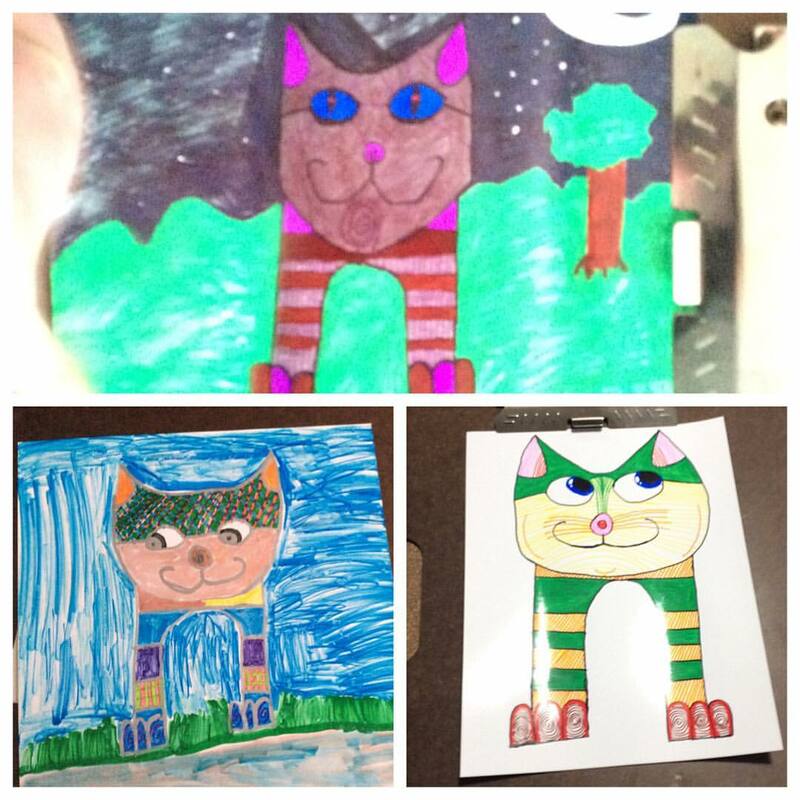 Each child gets to create an avatar, and that is how they get into their section of the program. This is set up in a rather game-like environment. 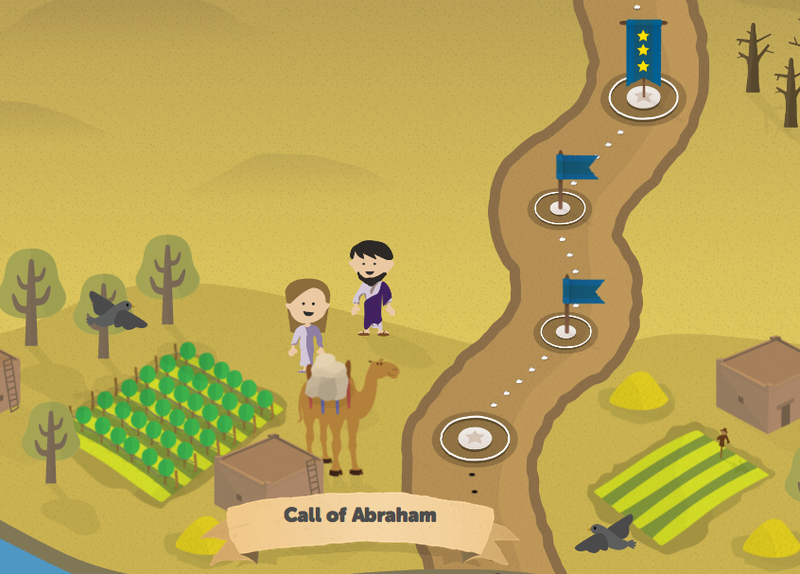 You progress across a map, and you get the little blue flags as you complete a "stop" or lesson. The plain blue flag signifies a completed lesson. Each lesson ends with either a worksheet or a game to review or test how the student is doing. The flags with stars on them are from lessons where there was some sort of a test, and the stars indicate how well the student did. This is the only "score" that is kept. That is one difference between the subscription and the self-paced program. 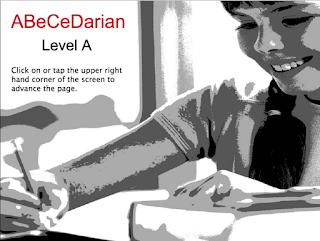 The self-paced gives you as the teacher the opportunity to go back to see how the student has done. I don't keep grades in elementary school, and I don't keep grades for bible courses at all, so the subscription is a better option for me. 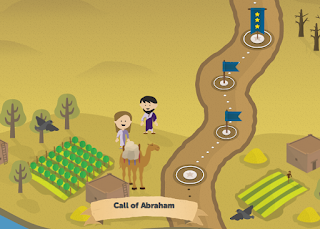 Each section (like the "Call of Abraham" above) consists of four lessons. The first lesson gives the big picture of that particular event, with the brother and sister team pictured at middle left being the ones who move the story along. Lessons two and three go more in-depth with additional details. 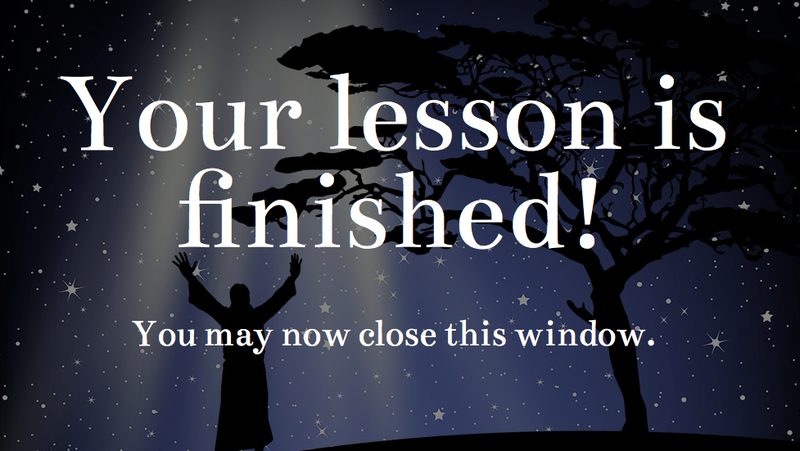 The final lesson is a quiz. The student is expected to learn dates, scripture references, and details from the story. I love that the dates given are all similar in this case, anyway. 2019, 2091, 2190, and 2910 all use the same numbers. I'm not necessarily a huge fan of memorizing dates in history, but this program does make that fairly easy to do. The top photo in this image is from the memory song that plays in most lessons. The bottom two are from a review game. Go check out other reviews from members of the Schoolhouse Review Crew.